This is a very unique build that I just finished. I wanted something different from the same 520 body over and over. If you are someone that likes to have something special then consider this mic. 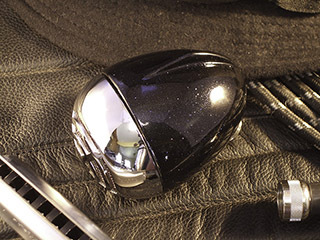 One of the main reasons for doing the machining is that a chrome mic tends to be slippery and I wanted a way to solve that problem but also have something more attractive and fun. The usual work has been done, Switchcraft connector, new wiring, grill screen and new grill silk. But, I also put one of the best sounding CR (controlled reluctance) white label elements I have ever heard into this body..hard to read the three letters . It really is strong and the tone is unreal. This mic does it all and checks all the boxes for a true CUSTOM harp mic. You have to play it to believe how good it is. A lot of work went into this mic and I believe you will love it and appreciate the details when you have it in your hand. This unique mic is also lighter than a standard 520. 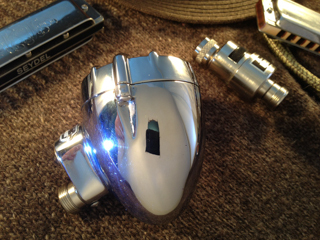 This is a classic bullet harmonica mic built by the Shure Brothers. 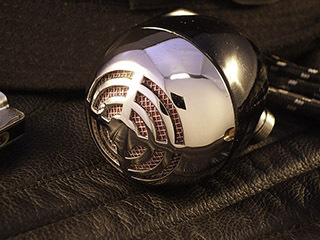 This mic employs a controlled reluctance element producing the classic blues mic bite. You are looking at a very early JT 30 which is actually a model, W30 from Astatic. 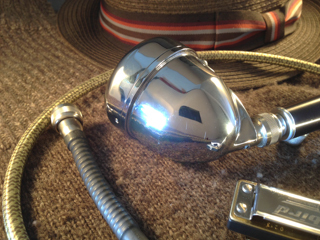 This mic has the original pain while I had the grill done in beautiful, polished Chrome! New grill cloth that really goes well with the whole package, new grill screen, new Switchcraft connector was fit, new wiring, new screws that also really feel good in the hand and go well with the mic. I put in a truly great Shure CM element, 1070 ohms assures a solid element and this thing is very loud but had perfect range. I have been playing in through my two Kalamazoo amps and it is just has a real Chicago blues sound. 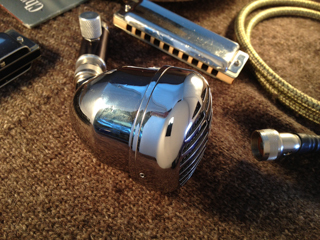 You are looking at a great, mint Astatic JT-30 harp mic. I left the original paint because it is really good. the grill is chrome and has original grill cloth. This mic was in great shape when I got it to build so I opted to leave the paint original. I put in a enormously strong CM element, it will amaze you! I cannot read the model number but it is super strong and has a great low end as well as a great full range. 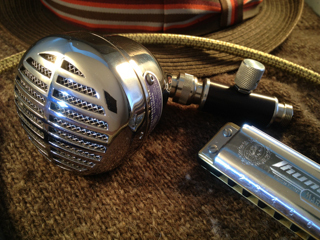 This is a work horse of a mic, old school and a great blues tool for harp players. New wiring, gasket, connector, element, stainless grill screws (allen)....ready to go. You will love this mic! I love playing it and you will too. Here is the mic you want most! 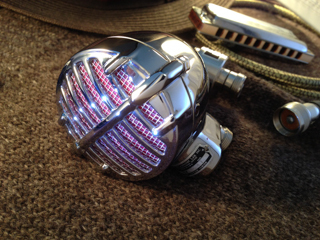 This is a Astatic Biscuit that is just a wonderful mic, great paint and newly chromed grill. New grill screen, New grill cloth, New connector fit, New wiring, New gasket,New screws etc. I put in a super strong CM element with great tone, something special for sure. It is a 99J86 from what I can read with a date I cannot read. Hard to read but the sound it what we care about. it has a ohm reading of 1129 so it is a solid element. Don't miss out on this beautiful Biscuit mic. The paint is 99% and with the new chromed grill and grill screen, it is just too cool! Please look at the photos close to see the detail. This is a great mic. This is a great mic for all you Blues players who like crystals. This has a great Japan crystal with deep lows and great full range. The Shure 707A is a very early model and this one is in grat shape and is a really cool mic to own. I put a new gasket, wiring, connector ect as is expected and kept the original grill cloth as it is in very good condition. You will not be disappointed with this mic. I kept this mic as original as possible for the nostalgia of it. I did fit a new Switchcraft connector, new wiring, new set screws that go with the theme and used heat shrink where needed. Look at how well this body and grill fit, that in itself is rare. The element is very strong and has deep base tones, great horn like mids and highs. This is a great mic! I chopped the body on this to make the mic as small and light as possible and machined the top fin then dressed it for a low profile that does not hinder use for long sets but actually helps indicate and secure the mic in your hand. New wiring, New grill screen and grill silk. New element gasket from harpmicgaskets.com along with a Super, Vintage Black CR element from Shure. This thing is so strong and has tone, tone and more tone to no end! It Honks!! 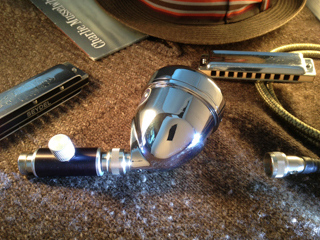 This is a chopped and trimmed Turner that is light, easy to hold and just checks all the boxes for a great custom mic. The grill was triple plate chromed, Chuck Gurney did the outstanding, deep black paint on the body. I machined the fin on top like I do to all these models then hand dressed until every edge was correct and smooth… it really looks cool and helps you hold the mic without any drama to your hand. When you are playing long sets, that sharp fin on the stock Turner Challanger is just a no no. This works and is old school COOL like a 57 Chevy or Cadillac! I put in the most outstanding, vintage Shure White CR element. You just cannot believe how good it is until you play it. It has full tone, great big low end and that horn like sound all the way through. The element sits in one of the new gaskets from harpmicgaskets.com’s inventory. New wiring to a new connector carefully fit to the now light shell. 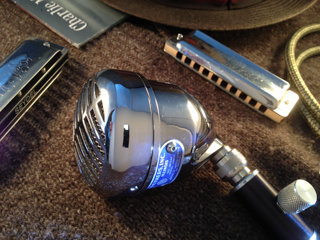 new grill screen and new grill cloth set off this very cool, blues player’s must have mic. This is a very unique Shure 520, full custom mic. I wanted to make it lighter so I turned the body down and re-shaped it then turned down the grill to fit. This was a lot of work but it paid off with a really comfortable to hold mic. Also, the tone is just out of this world! More resonance that it had in stock, original form. The tone is just amazing with the combo of the mic body and the Shure Black CR...! This is one super Black CR element and it produces all the bass and full range of tone you could ask for and then some. The grill has been tripple plate chromed and is deep. My bud, Jeff did the powder coat with a little bit of metal flake. New gasket as expected, new connector, wirting etc. It is OUTSTANDING and you will love it. The element is either a 99X or 99Y, because of the stamp over it, it is hard to tell for sure. This is a rare element! Contact me to purchase this special mic. This mic started life as a 1940s Sure Brown Bullet. 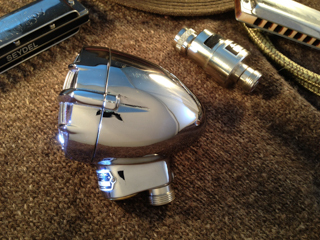 I love the size and weight but also like a full chrome mic. Chrome mics are hard to hang onto when playing under lights or in the hot sun so I needed something to make it secure in the hand. I took the body and turned it on my lathe then knurled the area where you hold the mic. This mic has a huge, Tone Beast, Black CR Element. It is amazing and a beautiful mic to own. 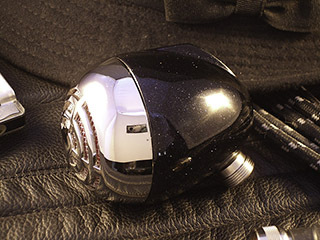 Take a good look at the photos and see the detail that went into this mic. This is only the second one that I have built like this, the first and original is in Japan with Osawa. Unique and something you will be proud to own and play. Black with metal flake and triple plated chrome grill. This is Astatic Model A, a very early model of the JT30 lineage. I love the full tonal range of this mic, it has to be played. 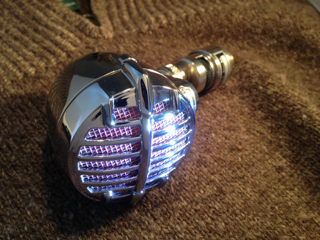 I used a White CR element that has this amazing full tone and in this custom mic, they are perfect together. This A has been triple plate chromed and as you can see, it is stunning. Those harp players who know and live the JT30 mics will appreciate the rarity and how special this mic is. Look at the grill, body, tag and see the details. 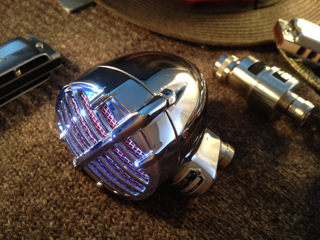 One of a kind, Full Custom Shure 520. I made the body much lighter and easier to hold as well as the grill by turning them down and hand shaping. This custom has been triple chrome plated and the original tag re-fit. This mic has a great and secure feel in your hand. A outstanding Black CR along with the metal work make this mic a Massive Tone Beast! Classy, one of a kind looks with BOOMING TONE! Please visit the "Order" page to check for availability and price.